EASTER MORNING. By He Qi. Please note -- A different approach to workshops for this unit. We felt Palm Sunday and Easter are times when more than usual numbers of kids attend, are visiting, etc. So we have found planning a series of 'stations' with assorted activities for various age groups has given all a pleasant time. But here we have also included a series of more traditional worm-type workshops in case you want to do a several week study of this story. The quintessential mystery of sadness turned to joy, as experienced by certain women at the empty tomb. Click here for NEAT BACKGROUND NOTES. Here for DISCUSSION QUESTIONS. Click the following links to go right to these workshops: Arts * Music * Drama * Kitchen * Storyteller * Computer * Movie * Egg hunt/pinata. Various hands-on arts projects for younger and older children, noisemaking activity, make object puppets then put on puppet play, many food ideas, book reading station for younger kids, computer program, video clip. Matthew 28: 1 - 10; Mark 16: 1 - 8; Luke 24: 1 - 12; John 20: 1 - 18. KEY VERSES: Mark 16: 6. But he said to them, "Do not be alarmed. You seek Jesus of Nazareth, who was crucified. He is risen! He is not here." (New King James Version). WHERE DOES THIS SCENE FIT INTO EASTER STORY. The discovery of the empty tomb by the women of Easter is the stunning conclusion of the Easter story. WHAT IS MEANT BY THE EMPTY TOMB? Footnotes in the New Oxford Annotated Bible/NRSV about the tomb at Mark 16 explain that the 'stone' was a "disk shaped stone rolled in a groove to close the tomb's entry." At Mark 16.1 - 8. Why the women went to the tomb. "The women go finally to perform proper rites of burial. Mk 16.5. Young man dressed in white. Was dressed "as a martyr vindicated by God would be dressed (cf. Dan.11.35; Rev.7.9,13), reminiscent of Jesus' garments becoming 'dazzling white' in the transfiguration, 9.3." Mk. 16.7. Jesus 'going on ahead.' "Jesus is vindicated and his movement is to continue. Mark's gospel is open-ended and must be completed by the hearers and readers of the Gospel. Mk 16.8. "The narrative ends with the women terrified. Obviously however, they eventually told the tale, or Mark's Gospel could not have been written." "Mark is by far the shortest of the four canonical Gospels and is generally thought to be the earliest, and to have been used in the composition of both Matthew and Luke. Because of the vague and indefinite references to the destruction of Jerusalem in Mark 13 (contrast Mt 22.7; Lk 19.43), the Gospel is thought to have been composed just prior to the widespread Jewish popular revolt that began in 66 CE and the Roman reconquest and destruction of Jerusalem and the Temple in 70 CE." OKAY. BACK TO NEAT FOOTNOTES. MOVING RIGHT ALONG (OR BACK!) TO MATTHEW...! At Mt. 17. 62 - 66. Pilate's command about sealing the tomb. "Only Matthew includes these verses. They are presumably meant to counter a post-resurrection accusation that the disciples or someone else... had stolen the body." Mt. 28. 1 - 8. Women at the tomb. 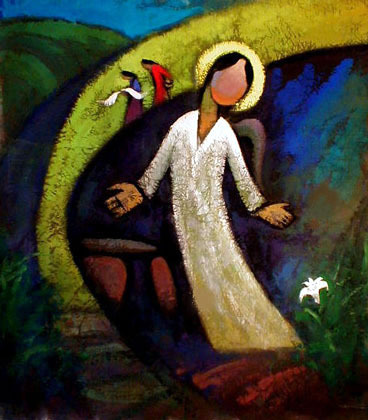 "Matthew follows Mk 16.1 - 8 in presenting women as the only witnesses to the empty tomb. Mt 28. 10. Gather in Galilee. "The followers are told to gather in Galilee, their homeland and starting point of the movement. Thus their return is part of God's plan, not flight from Jerusalem. At Luke 23.50 - 54. The burial of Jesus. "The sabbath began at sundown. Luke, perhaps having Gentile readers in mind, indicates the urgency of this burial custom." Lk 23.55 - 56. Women at the burial. "Spices and ointments were applied to the corpse." Lk 24. 4. Two men at the tomb. "The two men wear clothing that identifies them as angels, not ordinary humans... as do their sudden appearance and supernatural knowledge. At John 20. 5. Wrapping lying there. Grave robbers "would not have left the linen behind." "The most convincing evidence for the resurrection is the emergence of a community of believers in history, of which we are one small part... Additional convincing evidence is that the gospels tell many different versions of the resurrection. If there were only one fixed story, it would make me wonder if the event actually took place, or whether it had been 'cooked up.'" "The image of a wedding, the union of the bridegroom and the bride, is one of Jesus' favourite images for the apocalyptic or ideal world. It is essential to realize that in this case, the bride is actually the entire body of Christian followers. In the book of Revelation, this bride is identified with Jerusalem [21:2], or Israel, meaning people of God. "That suggests, first of all, that sexual imagery has relatively little to do with the actual relations of men and women. Thus, in this relationship where Christ is the bridegroom and the bride is the people of Christ, it follows that Christ is symbolically the only male. He is also symbolically the only individual, the only person with a right to say 'I am.' That means that the souls of the people of God, whether they are souls of men or of women, are all symbolically female, and make up a single bride figure." I include here "The Lamb," by William Blake. 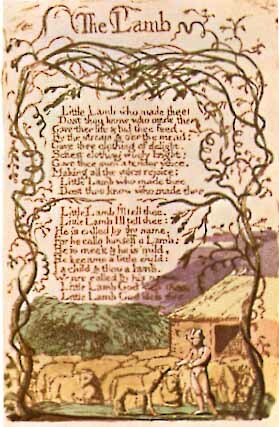 'Lamb' is one of Blake's illustrated poems from a work called 'Songs of Innocence.' Some kind of maturation to the state of 'greater innocence' seems to me what the resurrection is all about! The William Blake Page has kindly reproduced this work by Blake in the illustrated poem form in which it initially appeared. Creating their own illustrated poems is one of the suggested art activities for this rotation. So here's the link to the illustration version of Blake's "The Lamb:"
1. Where does this scene fit into the Easter story [beg, mid, end; give bit of detail]. 2. Why did the women go to the tomb? 3. Was this any big deal? Weren't they just following Jewish custom for burying the dead [yes, but there was risk because Jesus was considered a traitor]. 4. Is it significant to you that Jesus's resurrection was revealed 1st to these women, rather than to the chosen followers, the disciples, who were mainly men. 5. What do you that significance might be. 6. Does it matter that the gospel accounts of Jesus's revelation to the women at the tomb vary in detail. 7. Describe the range of emotions the women of Easter morning would have felt. 8. What do you feel on Easter morning. What feelings do you share with your family. MAIN ACTIVITY: MAKE ILLUSTRATED COLOUR PLATE, AFTER THE MANNER OF BLAKE, FOR KEY BIBLE VERSE. SUGG VERSE: "HE IS RISEN!" - neat effect markers for printing and filling in design, ie gold and silver pens, neon glowy markers, 3d spider writers, etc. a. Show the kids a print out of Blake's 'The Lamb' -- see link in background notes. b. Tell them they are going to make their own illustration sort of like this for a verse from the resurrection story. Could simply be 'HE IS RISEN.' You could pick another Bible verse. Or they could draft their own 4-line or so verse about how easter makes them feel. d. Work up finished designs on heavy stock with special markers. e. another idea -- it would be even more Blakean to use watercolour for the illustrations. Those watercolour pencils, where you draw and colour with the coloured pencils, then make watercoloury by swishing with water and a thin brush, would work great! Probably just lighter colour heavy stock paper would be best for finished designs. OTHER CRAFT IDEAS FOR OTHER STATIONS. POM POM SHEEP. Kids could make own oversize pom poms. (Good inst for these using just 2 fingers and yarn in Kids Can Press book of Crochet.) After pom pom made, kids can add googly eyes, maybe on black felt triangle with rounded corners for black face sheep, with black felt floppy ears and skinny rectangles for legs. BUTTERFLY MOBILE. I've seen a variation of this done with origami cranes and a super-large branch of a forsythia bush. Make a lot of tiny, multi-colour paper fans. Bind middles with half size pipe cleaners, ends bent for antennae. Attach with thread to one of ends of branch of some pruned bush. You need a cutting that has at least half a dozen nice twiggy ends. Find mid-section, balance point for attaching main top string. Should be good for 6 + fan butterflies. SPONGE PAINTED EGGS. Dab hardboiled eggs with quick drying paint on sponge. MARBLED EGGS. Put crayon bits in container of very hot water. Lower in hb egg on slotted spoon. Swirl thru wax for marbled look. EGG SHELL MOSAICS. Cut cross about of heavy boxboard. Collect broken shell bits from egg decorating. Cover cross with glue. Stick on coloured egg shell bits with glue. ACTIVITY: MAKE OBJECT THEATRE PUPPETS FROM KITCHEN UTENSILS. THEN ACT OUT PUPPET SHOW USING SCRIPT PROVIDED. - kitchen and cleaning utensils picked up cheap at recycling depot. Since ones with 'hair' like mini-mops and feather dusters would be good for the women hilited in this story, sanitary therefore new is better. These items best picked up at dollar store! - glue gun or bond fast/weldbond white glue. - simple backdrop watercolour painted on large paper. - could also use sheet across lower half of doorwar, backdrop on easel behind puppeteers area. - simple script for narrator plus few other voices. To see it, click link at end of drama workshop text. - Another simple script from point of view of one character, let's start with one of the women. - Script taken mainly from John's account, which has lots of running around, therefore good for overacting with puppets. - Narr. mainly sets up scenes. Puppets act out in moving tableau style. - If time allows, play can be done again, with kids trading narr and other major roles. - Easy to change narrative point of view. Altho not a lot of chars in this story after women, disciples and angel. You could insert some. How about some mystery onlooker. Or a grave robber (who got freaked out). Or some kind of animal at the scene (Hey, rabbit..could become some kind of myth blending Easter/rebirth/new babies in spring/Easter bunny perspective!!!). ACTIVITY: FOCUS ON POPCORN -- A FOOD THAT STARTS OUT AS A TOUGH UNTASTY KERNEL AND BECOMES A LIGHT FLUFFY SNACK FOOD (THAT TRANSFORMATION THEME AGAIN). There are tons of recipes that use popped popcorn on the web. Maybe use a popcorn maker. Or a glass pot for popping corn the old fashioned way so kids can see (sort of) it transform. Here are just a few recipes to choose from. POPCORN BALL EGGS. Form ball from popcorn and basic microwave zapped, marshmallow and marg mixture used for rice krispy squares. Decorate eggs with various cake decorating sprinkle and candies. POPCORN BUNNIES (CHICKS, WHATEVER...). Form animal from basic popcorn ball. Add const paper ears, feet, etc. Embellish with various candies stuck on with vanilla icing in a can. POPCORN GARLANDS. Like the perennial Christmas favourite, only the Easter version. Day old popcorn works best for poking with pin. Add dried fruit, maybe some small cut out paper crosses and hippy style flower power peacenik daisies. ** Most of these terrific ideas come from the JOLLY TIME POPCORN SITE. POPCORN NECKLACES. Make like garland above, only shorter, using all edible material. String with pc, dried fruit, day-old marshmallows, marshmallow candies, fruit loops. RESURRECTION ROLLS. These are neat to do if your kids haven't done them before. Insert marshmallow in Pilsbury crescent roll (seal edges really well! ), bake as directed, and when rolls are finished the roll is empty, just like the tomb. ACTIVITY: ASSIGN SOMEONE TO RESERVE SOME NICE PICTURE BOOKS TO READ TO LITTLE GUYS. OUR LITTLE ONES ENJOYED THIS BREAK FROM THE MAYHEM OF THE LARGE GROUP ACTIVITIES, THE STROLL TO THE RESOURCE/READING AREA. AND OUR READER ENJOYED AN UNCOMMON MOMENT WITH THESE TINY KIDS. There are lots of great Palm Sunday/Easter picture books for small children. For example, "The Easter Story," by Carol Heyer. Best to consult ahead of time with your resource centre coordinator, and pull half a dozen good ones. ACTIVITY: HAVE KIDS (YOUNGER) ACCOMPANY NARRATED EASTER STORY (SUGG. MATT'S VERSION) WITH VARIOUS TYPES OF NOISEMAKERS PROVIDED, RANGING FROM RAINSTICKS TO POTLIDS -- WHICHEVER BEST CAPTURES MOOD. Terrific instructions for this idea can be found on the rotation.org site: NOISEMAKER WORKSHOP ON ROTATION.ORG. Go. MAKE A JOYFUL NOISE! ACTIVITY: RESURRECTION SECTION ON LIFE OF CHRIST COMPUTER PROGRAM. ALSO DESIGN WEBPAGE TO SPREAD THE GOOD NEWS. 34. The Burial and Resurrection (Matthew 27:57-28:15, Luke 24:1-7). The women discover the empty tomb. How would you have reacted? ii. After reviewing story, have kids make own webpage. If Jesus (or angels) had appeared to them at the tomb in modern times, this might be one way they would get the message out. - Pick a point of view, ie Mary Mag. Site could be something like Mary Mag's Resurrection Sensation Site. - Kids decide what elements should be on it. Maybe file picture of a similar tomb. Maybe own art sketched in Child's Play. - Decide on other elements. Mary needs own account/feature story. She could also also post quotes from other in the story who can't believe it, say they are glad, whatever. - How about a mock poll. 'Can you believe it, yes or no? ' Fave links (made up)? Web photo album? - The list of possibilities goes on. The kids know best what they like on sites they frequent. ACTIVITY: VIEW SECTION OF CHARLOTTE'S WEB WHERE WILBUR WATCHES HER DAUGHTERS HATCH. INSTRUCTIONS. This excellent idea comes from 'Movie Clips for Kids, Faith Building Devotionals' by Group Publishing. This lesson idea also suggests a demonstration after the movie, where you drop lifeless raisins in a soda water bottle. After you drop them in, the raisins hop around in the fizz, which shows how Jesus's life and death brought forth new life, as shown also by Charlotte's babies. -	'Charlotte's Web' movie or DVD. -	video or DVD player + TV. EASTER EGG HUNT/PINATA IDEA. FOR LARGE GROUP. Part 1. the kids hunt for coloured plastic unfilled eggs. When done hunting, they talk about how all their eggs are empty and how that makes them feel. Part 2. The kids break a big pinata. Pinata could be shaped like an egg and painted like earth from space. When kids break this egg, goodies rain down on everyone. Shows how ultimately Christ's gift was for us all.